VI-GraphSim powered by Sim.co.VR. in conjunction with the usage of 180° wide-screens, provides drivers with an immersive environment for a unique driving simulation experience: through the usage of different cameras it is possible to satisfy the needs of drivers and track engineers at the same time. Replay function allows users to review driving simulator sessions and stop-and-go capability allows drivers to stop the driving session in any part of the circuit and to start again from that specific point without starting all over again: this feature is particularly appreciated by drivers when they have to learn a specific portion of the track, namely a chicane or a challenging corner. VI-grade provides, together with VI-GraphSim powered by Sim.Co.VR., a large variety of vehicle models from many different race series and from automotive OEMs and a large number of racing tracks. VI-grade, together with Sim.Co.VR, provides an unprecedented high-quality solution for graphic environment to be used on driving simulators and to visualize results from multibody simulations. VI-GraphSim powered by Sim.co.VR. gives users a new way to visualize vehicles, tracks, surroundings and any kind of road scenarios. 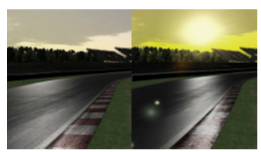 High-resolution graphic environment opens up new possibilities for realistic driving simulators, for promotional movies, for CAE results analysis.